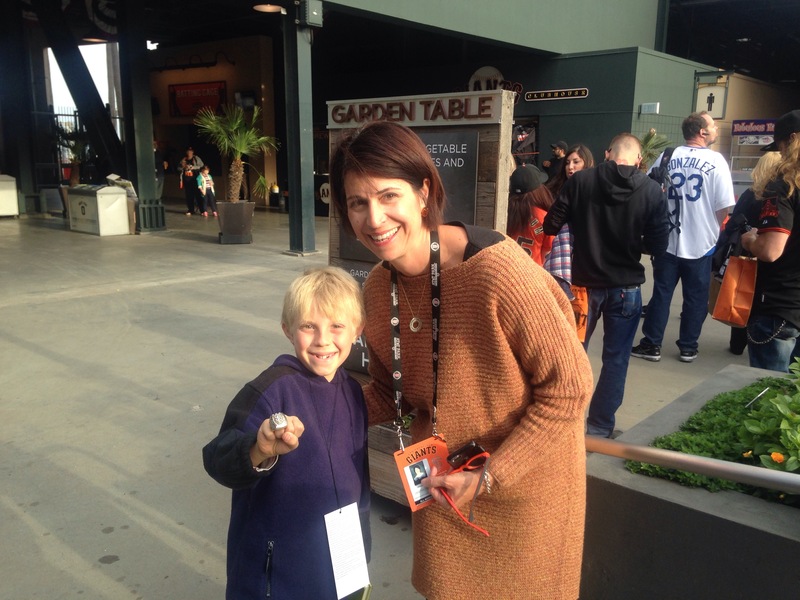 AT&T Park: 3 World Series, 1 Championship…and an edible garden! 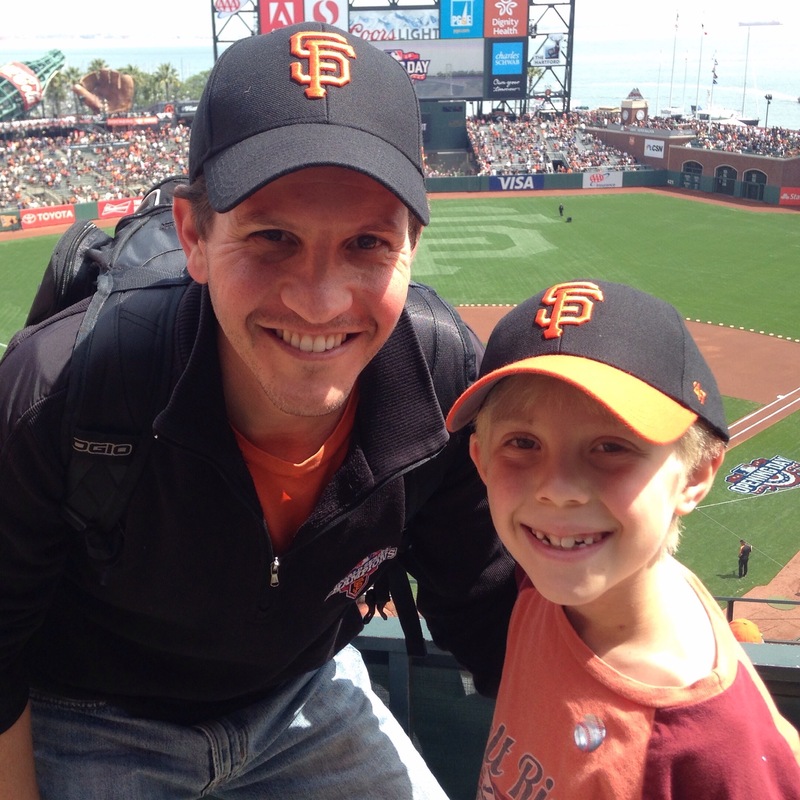 My blog post today features AT&T Park. 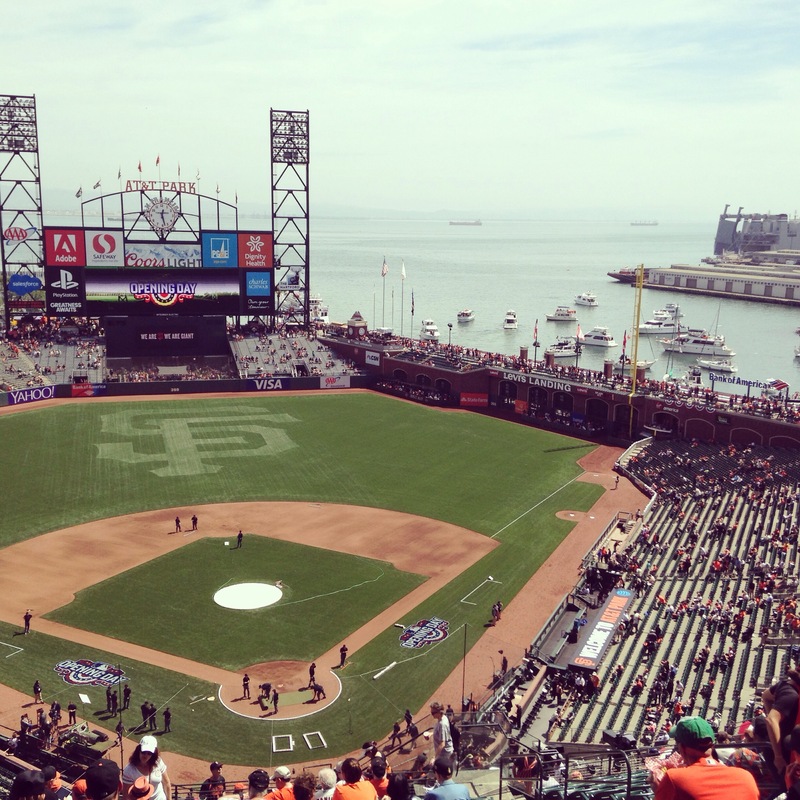 Did you know that the home of the San Francisco Giants has a garden right in the stadium? Today my review is going to be on the actual living food garden behind the center field wall of the ballpark. I think it is really cool that a sports stadium has a garden. 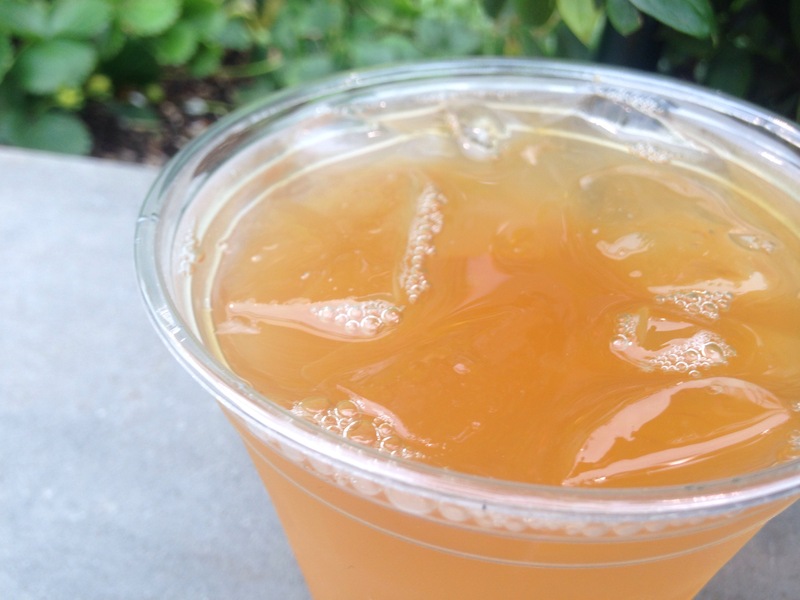 It shows me that sports stadiums can have lots of interesting and fun things, not just concession stands and screens and those types of things. 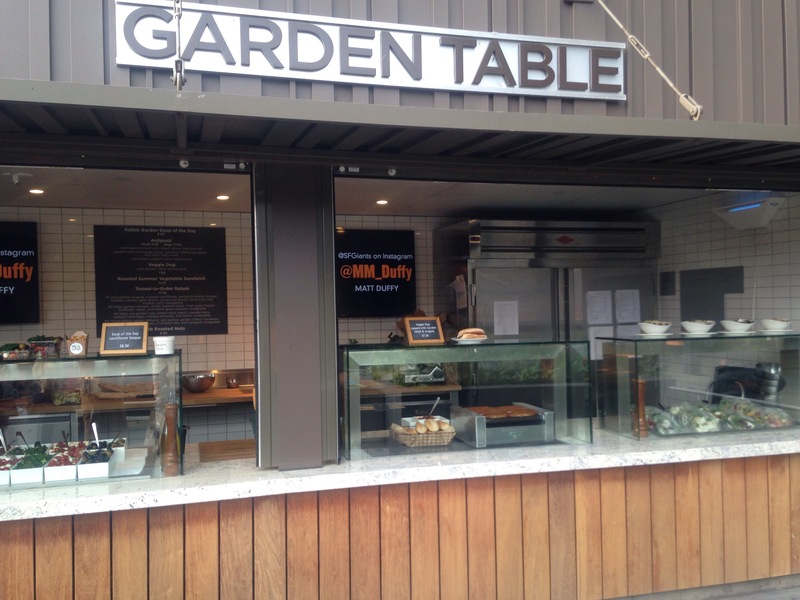 The reason the garden was made was to show people the team’s philosophy on healthy eating. To them, it is VERY important. 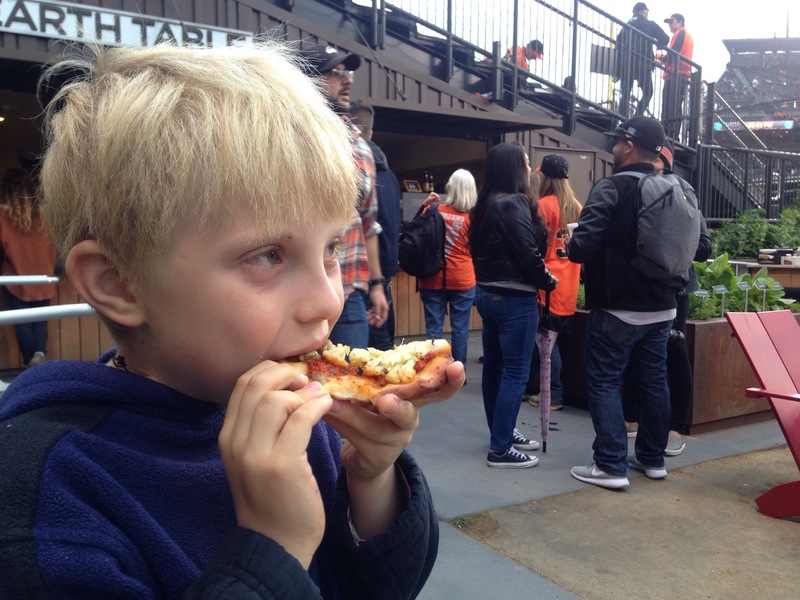 Also, I learned it is very important to my favorite Giants player, Hunter Pence. 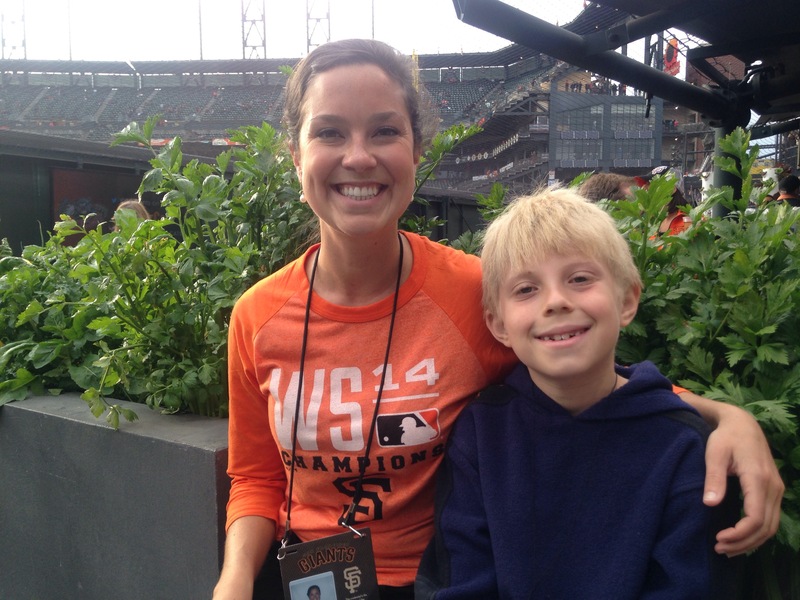 A fun fact about healthy eating for Giants fans, Hunter Pence’s favorite vegetable is kale. 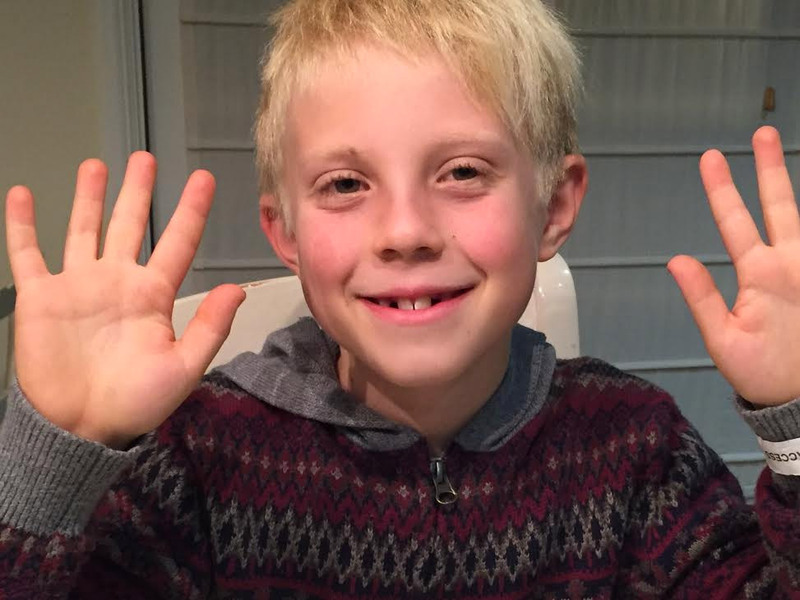 He even eats a whole bowl before each game! 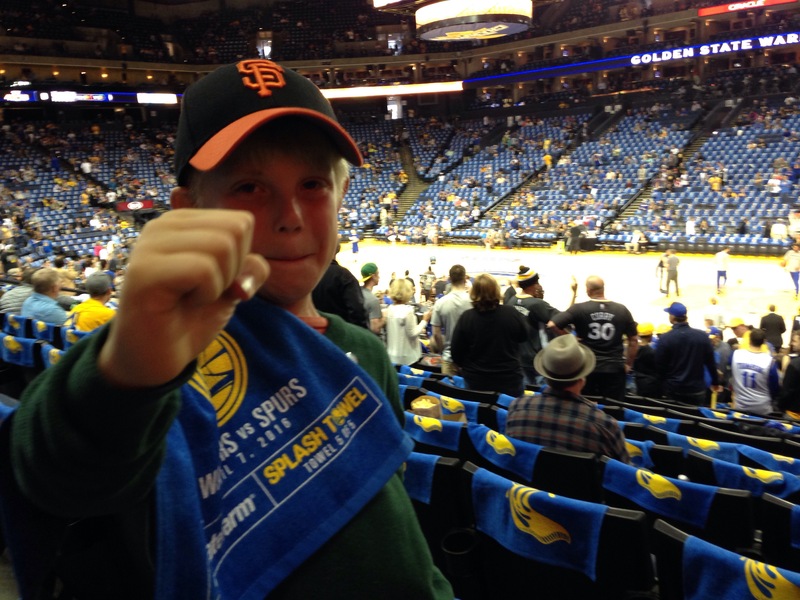 The reason I was in San Francisco was because my Dad and me went to the double header last Thursday: Giants Opening Day against the Dodgers at 1:30pm, and Spurs at Warriors in Oakland at 7:30pm. This sports weekend was really quite spectacular. I will always remember this trip. First, let me tell you about the Giants game. For the first 5 innings, the Dodgers were painting the field with walks, singles, and doubles en route to a 4-0 lead. Then the Giants were able to draw a walk in their first at bat in the fifth. A great bunt single by Tomlinson followed by a couple of fielder’s choice at bats advanced the runners. They ultimately scored 3 runs in that inning. The Giants shut down the Dodgers hitting while lighting up their pitchers. The day was capped off by a Grand Slam Home Run by Pence in the 8th. Giants win 12-6. Now, on to the Warriors game. The Warriors started off well and so did the Spurs. Then, in the second quarter, the Warriors went on a run to end the half up by twelve. The Warriors cruised in the second half though, and led by 20 something points at one point. In the fourth quarter, Steph Curry buried a bunch of threes, and the team from Golden State won 112-101. After a day like that, I could not imagine going back to the ballpark the next day. But I had plans to go back on Friday to review the garden because Thursday I couldn’t get a tour because it was Opening Day. Shana and Hannah who work for the Giants had a lot to do on Opening Day, but on Friday night, Dodgers vs Giants game 2, I got a special tour of the garden before the game. And that was good because I got to go to a bonus game afterward!!! First, Shana met me and took us through a special entrance (the players’ clubhouse) to the herb garden in the middle of the bleachers. After I said thank you, Shana left and Hannah came and showed us around the garden. And what a tour it was! The Giants Garden is very big. Right in the middle of the garden there are two restaurants. One is completely vegetarian and the other is completely gluten free. They are growing most of the food that they serve at these two restaurants. Hannah said that many people will get something gluten free from one kitchen and combine it with something vegetarian from the other kitchen. The food looked so good that I already knew what I wanted after 3 minutes! My meal was going to be a veggie dog on a gluten free bun, olives, and some sweet tea. But I learned just in time that the veggie dog was not gluten free. But there was a great substitution! Some gluten free flatbread made my day. 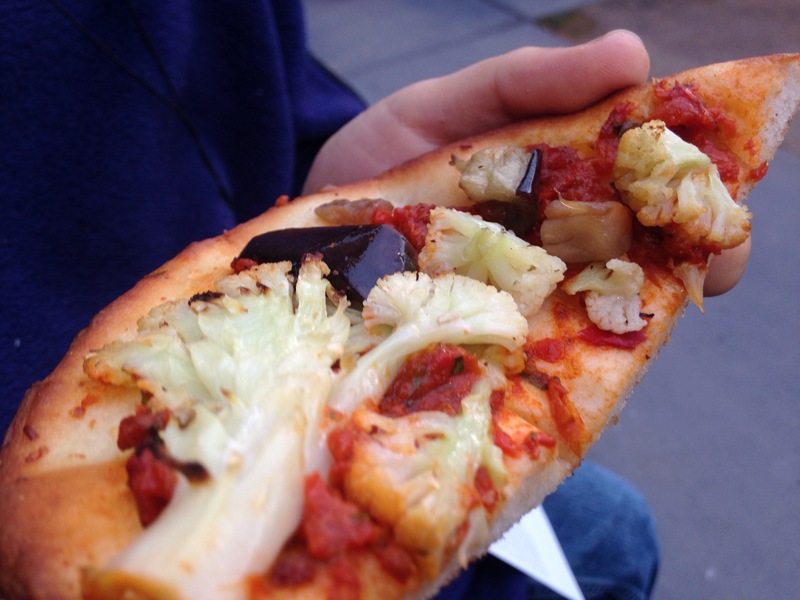 This flatbread had cauliflower, eggplant and a relish. And I got that sweet tea, too! The flatbread was kind of like a pizza crust. At the end there was a part that was more dense than the soft middle. The little chunks of eggplant were very important to the taste of the flatbread because they were the flavor that was sweet and a little salty at once. The grilled cauliflower gave that crunchy taste, and the relish was kind of that spicy taste. The tea was of sweet, of course. All together the combination was really outstanding and was perfect food for eating up in the stands. Hannah told me that last season they were making pizza, and a fan asked if they could make GF dough. Chef Dave and Chef Lonzo said yes and made the dough. Then, more and more fans were asking for gluten free dough so they made batches and batches for fans to enjoy. Now this GF cauliflower flatbread is one of their most popular items! Giants Garden is not just a place for special guests or people with a certain kind of ticket. Anybody attending a game can go there. It is a really popular place for fans to go before or during the game. 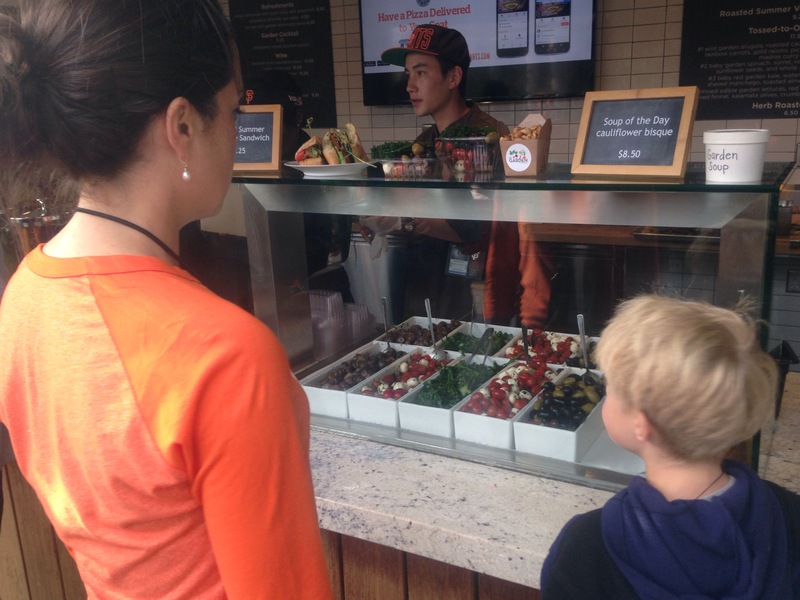 I can see why – lots of good food to choose from and it is a really unique aspect of a stadium. 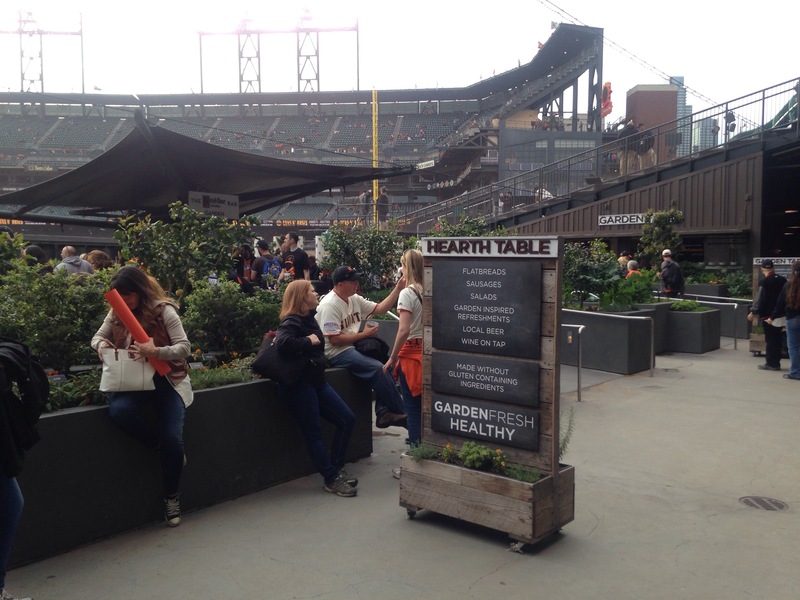 For any of my readers going to AT&T Park checking out the restaurants in the garden is a must do item.